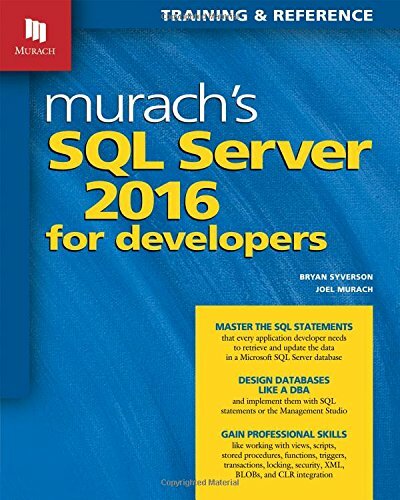 If you’re an application developer, or you’re training to be one, this 2016 edition of Murach’s classic SQL Server book is made for you. To start, it presents the SQL statements that you need to retrieve and update the data in a database. These are the SQL statements that you’ll use every day. Then, it shows you how to design a database, how to implement that design, and how to work with database features like views, scripts, stored procedures, functions, triggers, transactions, security, XML data, BLOB data with FILESTREAM storage, and the CLR integration feature. The result? You’ll be able to create database applications that are thoroughly professional. You’ll be familiar with the DBA-related issues that let you work far more effectively than most of your colleagues. And you’ll have a handy reference at your side to answer questions and handle new challenges as they come up. If you have any questions about this product by Murach Joel, contact us by completing and submitting the form below. If you are looking for a specif part number, please include it with your message.